Patrick Lencioni has a way of breaking down complex business and leadership problems into simple, yet powerful, self-help action steps. I believe at this point I’ve read all of Lencioni’s books, with The Five Dysfunctions of a Team being my favorite. This particular book is very, very short. Like, 166 large font pages short. And its a bit hokey, as some of his fable-style books can be. But it drills home incredibly important leadership lessons that any leader will recognize in themselves. I find that in this book, Lencioni drives home some important leadership concepts that are often overlooked. If you’re going to read this one, and you sometimes listen to audio books, I’d highly recommend listening to this one on Audible. The person reading it is fantastic. 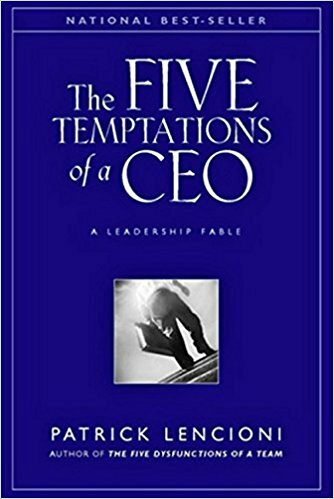 Highly sought-after management consultant Patrick Lencioni deftly tells the tale of a young CEO who, facing his first annual board review, knows he is failing, but doesn’t know why. Refreshingly original and utterly compelling, this razor-sharp novelette plus self-assessment (written to be read in one sitting) serves as a timeless and potent reminder that success as a leader can come down to practicing a few simple behaviors? Behaviors that are painfully difficult for each of us to master. Any executive can learn how to recognize the mistakes that leaders can make and how to avoid them.